Who is Brock Doors and Windows? Brock Doors & Windows Ltd. Who is Brock Doors and Windows? For many homeowners, finding the RIGHT window and door experts in Toronto is important. Hiring the wrong window and door company to complete your home improvement project can leave you paying more than you need to, and, in some cases, having to hire another company to completely redo the job. You want to know you can trust your remodeling project with a team of professionals that comes with an experienced background, fair prices, and a spotless reputation. Fortunately, this combination isn’t impossible to find. Brock Doors and Windows is a team of expertly trained window and door specialist that have spent over two decades earning a sterling reputation. Not only does Brock Doors and Windows pride themselves on their customer service and numerous referrals, but their dedicated staff also passionately stays on top of the newest window and door trends, ensuring your home gets the look and feel it deserves. Brock Doors and Windows in Toronto understands the importance of the windows and doors in your home. Your windows showcase the stunning view around your home, brings light into your favorite room, and creates a welcoming atmosphere for your friends and family. Your doors not only mean a lasting first impression for your visitors, but safety and peace of mind for your family. This understanding is the reason why every job done by Brock Doors and Windows is executed with excellent craftsmanship and attention to detail. With locations in both Brampton and Scarborough, the experts at Brocks Doors and Windows insist on making customer service a priority, and are ready to answer any questions you may have while helping to guide you through your next home improvement project. That’s why the majority of our customers return to us for all of their window and door needs. Not only will you and your home be treated with the utmost respect with Brock Doors and Windows, but your project will also be completed with the quickest turnaround time and attention to detail. You can rest assured that every window and door installed in your home will have a high quality and unsurpassed durability. 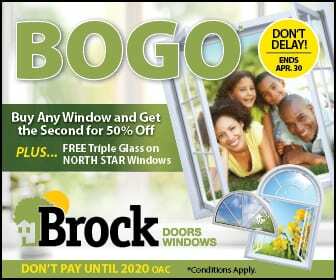 Brock Doors and Windows does the job right the first time so you save money, time and headache. Whether you are looking to install the windows and doors of your dreams, fix a project attempted by another company, or simply want to update the look in your home, Brock Doors and Windows has the experience and professional attitude you need to get it done. If you would like to learn more about all that Brock Doors and Windows in Toronto can do for your home, we suggest starting with a free quote. To schedule your free, no obligation visit simply call 1.800.449.3808 or feel free to visit one of our locations at 278 Orenda Road, Brampton, Ontario L6T 4X6, Canada or 2131 McCowan Rd, Scarborough, Ontario M1S 3Y6, Canada. We look forward to meeting you and assisting you with all of your window and door needs.